Robots are highly preferred for working in hazardous environments to avoid risk to human life. This is the major factor attributing the growth of nuclear robotics industry. Nowadays, robotics have become integral part of nuclear works and robots have to perform various functions in the nuclear reactors such as cleaning, inspection, waste swabbing, pallet loading, taking routine measurements, handling nuclear chemicals, and nuclear decommissioning, among others. Robots used in nuclear industry have to function in limited work space, must conform to facility, and have to work with high payloads. The report classifies the nuclear robotics markets by power type such as electric, hydraulic, and pneumatic. Though pneumatic powered robots have high speed, they have limited position control and low force potential and hence are used in limited nuclear applications. Electrically powered robots are more precise and have advanced control options. These robots are small in size and faster than hydraulic robots. Hydraulic robots have high force and long reach. These types of robots are robust and have high tolerance to shock loads and better recovery options. The report also highlights the major types of nuclear robotics. The major types are single purpose robots and reprogrammable robots. Single purpose robots have limited ability to perform various operations; whereas, reprogrammable robots are multipurpose with computer based intelligence capability. The report covers various applications of nuclear robots which include routine measurements, inspections, radiochemical handling, and nuclear decommissioning, among others. Besides, the nuclear robot market is further classified on the basis of components such as robot hardware, software and services. 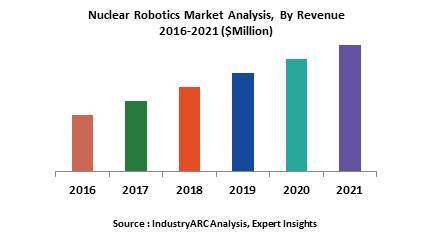 The report gives analysis of various factors such as demand and supply side factors, market dynamics, and driving and inhibiting forces in the nuclear robotics market. The compact size, cost effectiveness and high safety provision to human life from harmful radioactive materials are some of the major factors driving the nuclear robot industry. The pricing analysis of nuclear robots and its impact on value chain of the industry is also analyzed in the report. The opportunity matrix, product lifecycle analysis and mapping of major suppliers and OEMs are also covered in the report extensively. The competitiveness among the leading players in the nuclear robotics marekt is measured based on the business developments strategies adopted such as new product launches and developments, mergers and acquisitions, partnerships, and collaborations.